X-Wing Miniatures is far and away my favorite tabletop game. It's easy to learn and quick to play, yet has a surprising amount of depth. As an added bonus, it features just about every iconic character from the Star Wars Galaxy, including my personal favorite, Darth Vader. Now that Fantasy Flight Games has release the Imperial Raider-class corvette along with some new upgrade cards and pilots for the TIE Advanced, the Dark Lord of the Sith will finally be crushing the Rebel scum! Introduced in September 2012 as part of Wave 1 in conjunction with the Core Set, the TIE Advanced has been around since the earliest days of the game. However, apart from a rare list here or there, the TIE Advanced (along with Darth Vader) had been notably absent in the competitive scene due to the ship's point cost compared to what it brings to the table. 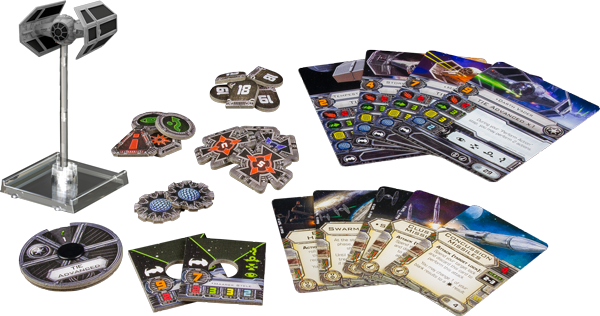 As Fantasy Flight Games released more and more new cards (Systems Upgrades, Titles, etc. ), this became more noticeable and the TIE Advanced (along with Vader) was passed over in favor of cheaper, efficient, and more well-rounded ships and pilots. Fortunately for players, Fantasy Flight Games has known about this problem and had long promised a fix to bring the ship back into the fold. Now, with the arrival of the Raider-class corvette and the fixes to the TIE Advanced earlier this week, we can start to build squads featuring the TIE Advanced that are both competitive and fun to play! The following four squad lists will all have one thing in common: Darth Vader. Lord Vader is one of the most skilled and feared pilots in the Galaxy and he makes a great anchor for both thematic, fun squads and competitive squads. With each list, I will talk about the basic strategy of playing the list on the table and both its strengths and weaknesses. Please keep in mind that even though these lists are designed to have some competitive edge, I cannot stress enough that theme and enjoyment was the main component in putting these lists together. This list combines Baron Fel in the nimble TIE Interceptor with the brute force of Vader in the TIE Advanced, both ace pilots flying at Pilot Skill 9. The strategy is to have Vader and Fel begin stripping shields and then dealing damage cards so Colzet can utilize his pilot ability to begin flipping those damage cards face up. Since the Lieutenant is also equipped with Accuracy Corrector, he is guaranteed to put two hits on the target as well. At 99 points, there is also room to equip Vader with Predator instead of Lone Wolf, but I like the defensive aspect of the latter. The most glaring weakness is the lack of hit points, a combined thirteen across all three ships. Luckily, the TIE Advanced is relatively tanky and Fel with his chosen upgrades has probably the best damage mitigation available in the game. This list is all about offense. The TIE Phantoms, with their four dice attack, can wreck havoc on enemy ships. The trade off is their low health and agility, making them true glass cannons. With the addition of Rebel Captive and Tactician crew upgrades, the Phantoms can bring a little bit of control to the game as well. Adding Stygium Particle Accelerator to the Phantoms helps them gain defense when cloaking and uncloaking by granting them a free Evade, something that is desperately needed for them to survive. Alternately, Predator can be replaced with the cheaper Lone Wolf on Vader, freeing up an extra squad point to allow the Sigmas to both take Recon Specialist, giving them two focus tokens and an evade token every time they uncloak and take a Focus action. The goal is to lure the opponent into chasing after Vader, allowing the two Sigma Squadron Pilots to try and flank them, keeping them out of harms way. An alternate strategy is to use the Phantoms as blockers, keeping the enemy where you want them and allowing Vader to swoop in and fire. Like the first, this squad is low on hit points and also more difficult to fly, especially if you aren't used to the cloaking mechanic. The major weakness in this is the Sigmas; flying without the benefit of Advanced Cloaking Device and given their low pilot skill, the Sigmas are much more susceptible to turrets and aces then their higher PS cousins ("Whisper"/"Echo" + Veteran Instincts). This triple TIE Advanced aces is all about maneuvering. Juno's pilot ability allows her to make nearly every maneuver in the game, save the S-loop which is currently only found on ships in the Scum & Villainy faction. Her hyper-mobility allows her to take full advantage of the Outmaneuver elite talent upgrade, making her attacks much more of a threat. Another option for even more maneuverability on Juno is to give her Stay on Target, which will allow you to first change the direction of your chosen maneuver and then change the speed. This will make Juno one of the most unpredictable pilots in the game. Keeping with the maneuverability theme, giving Vader the Daredevil elite talent gives him access to the speed 1 turn, something the TIE Advanced does not normally have. At the cost of a stress, Vader can now use his second action make a speed 1 turn even after boosting or barrel rolling, setting him up for the best possible shot. Adding Maarek Stele with the new Advanced Targeting Computer systems upgrade (via the TIE/x1 title card) means he is able to potentially make the most out of his pilot ability. Giving him Veteran Instincts means he will be moving and shooting along with Lord Vader, make this a true ace squad. Another potent option for Stele is equipping him with Calculation, giving him yet another opportunity to deal a face up damage card. A combined fifteen hit points between the three ships and the complete lack of defensive upgrades means these ships are susceptible focused fire, but their upgraded attack should help eliminate their enemies a little faster. Not only is this list strong on the table, it's heavy in theme as well; two of the Empire's best pilots escorting their Emperor in his shuttle. The Vader and Fel load out is similar to what we've seen in previous lists, but this list introduces the most expensive upgrade card currently in the game, Emperor Palpatine. While his lap dog Vader and his best fighter ace Fel harry the opponent, the Emperor lurches slowly along in his shuttle, using the Force to affect the outcome of combat as it unfolds before him. Giving Fel the ability to change the result of one of his defense die once per turn could make an already slippery target even harder to hit. The Emperor could also use his ability to give you that extra hit you need to finish off an enemy ship by turning a blank into a critical hit! This leaves your opponent a tough choice: should they focus the shuttle down to strip your ability to use the Emperor to modify die results or should chase after Vader/Fel to prevent them from flanking you but allowing the Emperor to potentially affect die rolls for nearly the entire game? This is an exciting time for X-Wing. The addition of the new cards and pilots available in the Raider has the potential shake up the current competitive meta game in ways we haven't seen before. I'm looking forward to seeing more TIE Advanced ships on the table in the near future. Personally, I will be flying the first squad on this list next week at the monthly tournament at my local game shop, Huzzah Hobbies. I don't expect to be alone in fielding the TIE Advanced next week and I can't wait to see how the ship will perform in the game!